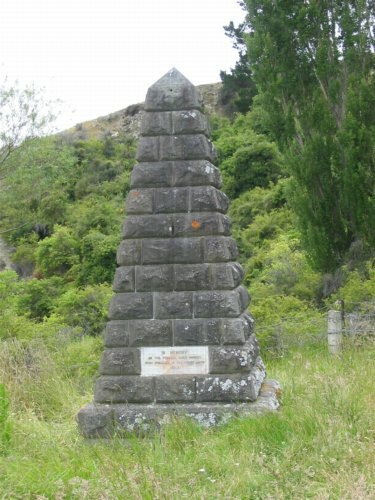 About 23km north of Roxburgh there is a monument commemorating the many unknown miners who perished in the winter snow storms and floods of July and August 1863. Further up the creek above the road, is the site of the former settlement of Chamonix, named after the French alpine resort. Chamonix flourished briefly during the 1860s, but the little packers town ceased to exist by 1866, although one store that was operated by Johnny O’Briens did remain for some time. Soon afterwards O’Briens shifted his store away from the gorge to run it, together with a hotel, changing place, and stables for Cobb and Co coaches, till the Shingle Creek Hotel was built about 1870. Today the stables survive, virtually unchanged, as part of the woolshed on Gorge Creek Station. No evidence of Chamonix remains today and even its precise location is not known.